2. Designed to increase horsepower & acceleration. 3. All clamp directly to the carburetor throat, replacing the stock airbox and filter element. 4. High flow air filter with excellent filtration and dependable protection for long engine life. 5. Washable and reusable air filters that are easy to clean and reuse. 6. This product is double-layer steel mesh filter mushroom head. 7. Suitable for different engine compartment layout of the models. 8. Make your engine breathe more smoothly. 9. Long service intervals up to 50,000km depending on driving conditions. 10. Environmentally friendly reusable air filters. 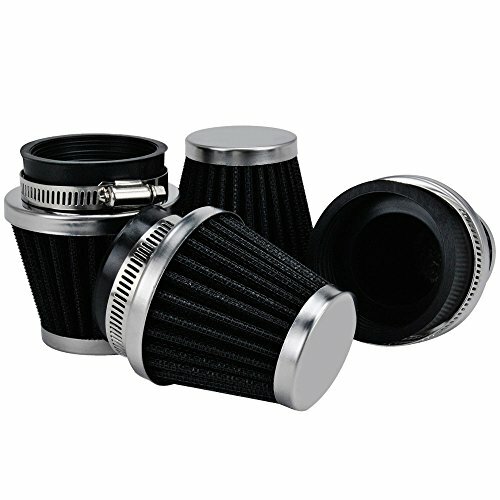 This 48mm pod filter is an universal item, will fit for motorcycles, dirt bike, ATV, moped, pit bike, scooter and other vintage bike. There are roughly 2 different model motorcycles in the market presently. One of the motorcycle (model A), can see the air filter exposed to the outside from the appearance. The other motorcycle (model B), there’s a plastic board will cover the installation place of air filters. Whatever your motorcycle is model A or model B, please accurately measure the size of the filter before purchase, and ensure that you can safely install the product. Thanks for the cooperation!! Compatibility – 48mm universal air filters are designed and manufactured for a wide variety of applications. Please ensure that it will suitable for your motorcycles and you can install it properbly. Thank you! !